TAGBILARAN CITY—Farmers Cipriano and Marcela Curay woke up early on Jan. 27 to prepare 20 baskets of “ubi” (yam) that they would bring by bus from their house in Alicia town to this capital city some 100 kilometers away. The distance was far from their mind. 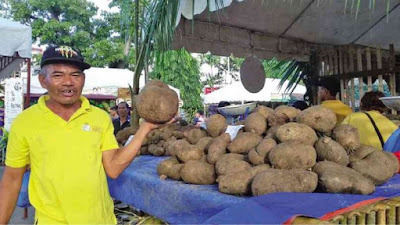 They have long been looking forward to the 16th Ubi Festival, which is held every January to showcase the yam, Bohol province’s revered and most important crop. “They kiss the ubi when it falls to the ground [whenever they transport it],” plant pathologist Zenaida Darunday says. Not doing it is an act of disrespect and may bring misfortune, she adds. The local reverence for ubi traces its roots to stories about how the crop saved them from drought. “According to legend, there was famine in Bohol and [people] survived because they found ubi when they were digging the soil. Ubi survives during drought and famine,” Darunday says. “When they saw ubi, they praised God because it saved them from starvation,” she says. The food crop is grown in Tagbilaran and in 47 towns in Bohol, usually in May or June, and is harvested from December to January. Seventeen towns are considered the biggest producers—Alburquerque, Alicia, Antequera, Baclayon, Corella, Cortes, Dauis, Dimiao, Garcia-Hernandez, Lila, Loay, Loon, Mabini, Maribojoc, Panglao, Sikatuna and Ubay. Cipriano, 53, has been planting ubi in Alicia since 2010. He planted 50 kilograms of tubers in his 200-square-meter farm in July so he could harvest 650 kg by December, in time for the Ubi Festival. Each kilogram sells for P35 to P60. The most expensive is the “kinampay,” the so-called queen of ubi varieties and famous for its sweet scent. The Curays say the root crop has helped their family survive, especially as the dry spell continues to bring agricultural losses to the province. Drought has dried up rice paddies, prompting farmers to plant ubi tubers instead. “Ubi has been a great help to us. We cannot plant palay [because of the drought]. Only ubi can help us,” Cipriano says. According to Darunday, yam has nutritional values that can sustain families, especially during those times when they have nothing else to eat. It is an excellent source of vitamin A (beta carotene), a very good source of vitamin C and manganese, and a good source of copper, dietary fiber, vitamin B6, potassium and iron. “When you eat ubi, you won’t be constipated,” Darunday says. The kinampay variety has anthocyanin, a strong antioxidant, she adds. “It’s a good alternative to rice. If we are trying to cut down on rice consumption, ubi is a substitute,” the scientist says. Ubi is also good for people with hormonal imbalance and for women with menstrual cramps. But all is not well in the ubi industry. In recent years, crop production has steadily dropped, which Darunday attributes to aging farmers and the disinterest of their children to follow in their footsteps. Although ubi thrives despite the absence of water, extreme weather brought about by climate change has disrupted production. Darunday, however, is confident that like ubi, resilient Boholanos will overcome the impact of the drought that has ravaged farms in the island-province. Ireneo Gabato, municipal agricultural officer of Sikatuna, says his office had given tubers to the local farmers to encourage them to produce more crops. “We have a plant-now-pay-later scheme. If they plant 20 kg of ubi tubers, they should return 20 kg of ubi to our office,” he says. The Ubi Festival has become a venue for farmers and their families to learn how to improve their production and crop quality. It was first organized by Bohol Ubi Center Foundation Inc., but later events were by the provincial government, particularly its agriculture office. “I hope this becomes an avenue to invite farmers and attract young people to plant more ubi in Bohol. Young people should know the importance of ubi,” Darunday says.